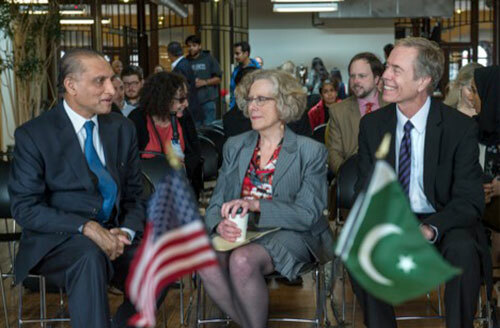 The Virginia Commonwealth University (VCU) Hubert H. Humphrey Fellowship Program and the VCU Global Education Office hosted an April talk about the future of U.S.-Pakistan relations with the Pakistani ambassador to the United States, Aizaz Ahmad Chaudhry. 2017–2018 NIDA Hubert H. Humphrey Fellow Rabia Hanif of Pakistan arranged his visit. Ambassador Chaudhry, left, talks with Wendy Kliewer, Ph.D., professor and chair of the VCU department of psychology, and J. Randy Koch, Ph.D., VCU research associate professor and coordinator of the Hubert H. Humphrey Fellowship Program.